The sound of gunshots filled the room as police filed in. 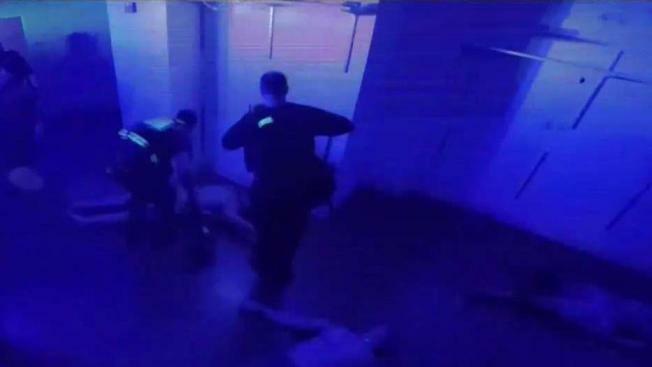 They were in pursuit of the gunman, assumed by a Fairfax County firefighter in a simulation meant to immerse first responders in an active shooter situation. Officers rushed past mannequins on the floor simulating injured employees. Then, they moved toward the shooter in a back room, each positioning themselves in a different spot. Their primary task was to end any threat so medical teams could enter and assist those injured. The county’s police and firefighters collaborated during Tuesday’s active shooter training, a new approach to preparing for the high-pressure active shooting scenarios. "The radio traffic that you hear, the chaos, the quick-second decisions that you have to make — it's almost the same,” Fairfax County Police officer Gershon Ramirez, who last participated in a comparable training about a year ago, said. After identifying the first shooter, officers determined whether there were any additional threats. Until every room was searched and cleared, officers and fire rescue officials couldn't tend to the wounded. Once the scene was secure, police decided where to direct fire rescue officials. They also provided minimal medical assistance until medics arrived. Fairfax County police and fire rescue officials learned how valuable the training can be last September when they responded to an active shooter situation in an office building near Merrifield, Virginia. Now, they have a revised approach, which Ramirez said resembles the real-life scenarios without people running and screaming at first responders. "You try to at least focus on the one thing, if not you're going to get turned away and you're not going to be able to accomplish your goal,” Fairfax County Fire and EMS official Wayne Champagne said.